After a month of treatment, visual inspection of the honey bee hives for infestation showed a significant decline in the number of varroa mites (a.k.a varroa destructor). In the honey bee hive treated with Matrix Drops there were between twenty and fifty varroa mites recorded. Subsequent examination of the neighbor beekeeper’s honey bee colonies, which he treated with standard chemicals commercially available agaist moths, most colonies contained six hundred to one thousand varroa mites. The experiment was well documented for those honey bee hives treated with Matrix Drops and the commercially available insecticide. Important controls reflect recordings which show that the amount of both treatments applied to the hives and the application method are identical. The honey beekeepers indicated to our company their satisfaction with the Matrix Drops treatment, and further added that their honey bee hives seem to respond well to the Matrix Drops. „We will continue! Thank you so much for the wonderful experiences, and hoping to be able to continue informing you about wonderful results; and working and living for this phylosophy. We will attend Kovács-Magyar András’s school starting in autumn. We would like to make ours the measuring of the aura and those invisible worlds to be able to utilize such knowledge in the best interest of our honey bees. A recent emergence of an unusual enemy, originated from Asia, the varroa mites (a.k.a. varroa destructor and varroa jacobsoni), have spread to Europe and are threatening colonies of bees spanning from Eastern/Central Europe towards the West. According to certain sources, the honey bees are threatened towards extinction due to the extremely aggressive reproduction of these external parasitic mites. The Hungarian Agrarian Sector announced publicly on July 27, 2017 that due to the increased number of varroa mites originated from Asia the local honey bee colonies have decreased by 75%. We could see from the honey beekeepers letter above that the painful news about the Asian varroa mites is sadly true. These vampire mites are extremely resistant; they are not affected by commercial chemical parasite treatment. 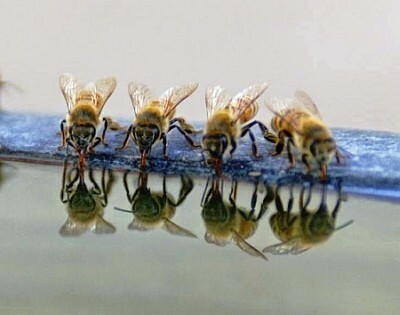 Most of the honey bee stands infested by these mites have to be destroyed, more specifically, they have to be burned, as the only way to counter the parasites’ spread. By now, many honey beekeeper can take full advantage of the extraordinary blessing of Matrix Drops effectiveness against mites. The Matrix Drops products are not the traditionally understood medicine or medicinal products. This Matrix Drops program is a joint research projecr that tiredlessly works to save honey bee colonies. This program introduces a new Matrix Drops product where experimental research aims at increasing the honey bees’ strength, spirit, and lifespan. We also took into account additional threats to honey bees; both in their organism as well as in their colonies. These include effects of different pesticides and resistence to antibiotics. In todays world, everybody promises and guarantees something. We don’t promise or guarantee anything. Due to the Matrix Drops treatment ,even in the first couple of days, the increased aura of the bee hives is measurable with radiesthetic methods. All those who get to use our products on their bee colonies can request an experienced radiesthetician to perform check up measurements. You all will be schocked with the results! The bee colonys’ energy emission multiplies due to the use of Matrix Drops products by farmers. The way the aura of bee hives increases, their energy level, radiation, as well as pep and spirit also benefits. It is important to observe the changes in the bee colonies performance, production and infestation; all of which result from Matrix Drops product use. All participating beekeepers are encouraged to report prognosis and results during the experiments. Passing onto affected others any successful results could be very supportive for struggling beekepers and their colonies. We are driven by results, and these open new doors to lead beekerpers out of this infestation maze. Our complex products are water based, do not contain chemicals or chemical matter; they are simply pure information component. They are made with a unique quantum physical process. There are two types of Matrix Drops products recommended for honey bees: 2019 (daily treatment) and 2020 (monthly treatment) Matrix Drops (MD).Some make the honey bees drink the drops, some use a paper towel and dap it in the dropps and place it in the honey bee hive. Since these hard-working bugs carry every foreign material out of their hives, they get into contact with the paper towel dipped in MD drops. The MD drops are a perfect program carrier, only a few drops will suffice to cure the honey bees’ aura. There are many other practical ways of getting the MD drops to the honey bees. If you would like to learn more about our invention, you can find more information on our official website at www.matrixdrops.com. We welcome every interested person in our school starting on October 14, 2017 . I provide our audience with the opportunity to acquire the techniques of aura measuring, and to become familiar with the sensing of unvisible worlds.